The creamiest Pumpkin Cheesecake can be made at home. It will rival anything you can get from a restaurant. Just try it. Who doesn’t love pumpkin cheesecake (a million hands just went up, right?). 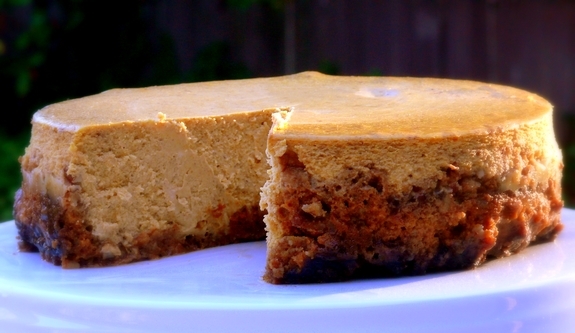 And who wouldn’t love pumpkin cheesecake with a gingersnap-pecan crust? Well you’ve come to the right place. I often prefer pumpkin cheesecake to pumpkin pie at Thanksgiving, it has such a creamy, yummy texture and is a good addition to all the other desserts I will be making for the Thanksgiving dessert buffet. To make the crust, preheat oven to 350o F. Butter an 8″ springform pan (make sure it’s the right size). Cover the outside of pan with 2 layers of foil. Stir together all crust ingredients. Press into bottom and up sides of pan. Bake for 10 minutes. Let cool on a rack. 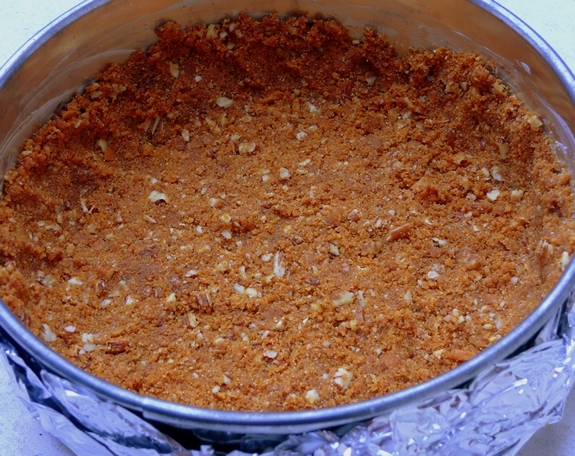 To make the filling, with an electric mixer on medium speed, beat cream cheese and both sugars until light. Beat in eggs and yolks, 1 at a time. Beat in pumpkin, sour cream and vanilla. Reduce speed to low; beat in flour and spice. Pour into crust. Place cheesecake into large roasting pan, as you see here. Fill pan with 2″ of hot water. Bake until cake is set around the edges but still slightly jiggly when lightly shaken (cake will firm as it cools), 55 to 65 minutes. Once you check the cake for doneness, turn off the oven and leave the door closed for several hours. It is the sudden changes in temperature that cause cracks in the tops of a cheesecake so let it slowly cool down in the oven. After several hours it will still be warm, go ahead and pull it out of the oven, still in the roasting pan of water and let it cool more on the counter. Once cooled, remove it from the water, cover it and refrigerate it overnight or up to 2 days. Here it is…crackless cheesecake. You can really see the creaminess of this cheesecake here as the sunshine glistens away. I better eat it quick. After several hours it will still be warm, go ahead and pull it out of the oven, still in the roasting pan of water and let it cool more on the counter. Once cooled, remove it from the water, cover it and refrigerate it overnight or up to 2 days. Congrats Bonnie… yes to a 2nd bridal shower, and then a third one too please! That’s a fab cheesecake Cathy! Easy to make, and looks delish! Hey, you mentioned taking the pan out of the water, but never put anything about putting the water IN the roasting pan. How much? Just a little? Half full? I need to know, as I will definitely be making this for Thanksgiving! Also, loved learning the new tip about the cracks in the cheesecake! Well that is a problem isn’t it? Okay, 2 inches of hot water into the pan. Congrats Bonnie and this cheesecake looks unreal…thank you for sharing this recipe!!! love pumpkin cheesecake. gingersnaps is an excellent idea cath. that was an awesome giveaway you had. congrats to the winner indeed! I have to say that this is in my opinion the best way to eat pumpkin!!! Congrats to Bonnie! What a fun shopping trip that will be! 🙂 I’m on vacation so just found out about this giveaway when I was able to get internet again. Cathy, you are the bomb with these amazing giveaways! 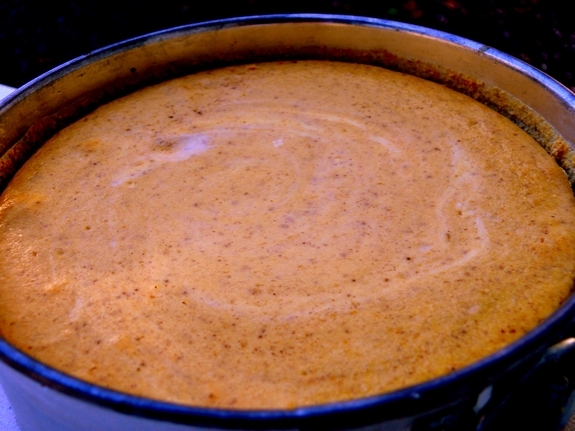 Pumpkin cheesecake…I love it! My sister-in-law makes a fabulous one and I request for every birthday and family gathering! Thanks for this one too! pumpkin cheesecake is probably my favorite dessert. this looks so delicious! 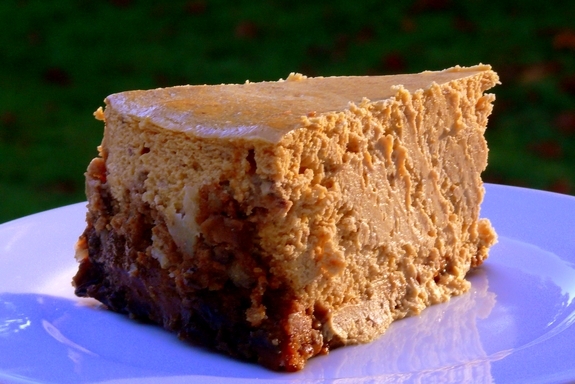 Discovered your blog by accident and stumbled across this delicious looking pumpkin cheesecake. Can’t wait to try it! Pumpkins are plentiful in Portugal at the moment, and cheap! I am ashamed to confess I have never cooked with them before. ZOOBAMOOFOO that cheesecake looks good! Agreed! The gingersnap crust is a must with pumpkin cheesecake, yummy- I would lovethe addition of the pecans too. I know a lot of people will find this hard to believe, but people who are not married cook as well, and we don’t even get ONE bridal shower. Here is to bachelorette showers for those of us who haven’t made the what is the often poor decision to get married and want to cook anyway! The cheesecake looks incredible. I love all the pumpkin recipes this time of year. I am drooling!! I love anything with pumpkin, especially this and have always wanted to make it myself!!! thank you!! Congrats to the lucky winner too! Try it with a bourban pecan sauce….it’s even more delicious! Thanks everyone for your kind words! I was in shock when I saw my name….I first thought…”Oh there’s another Bonnie S.!” Then I read on in disbelief that I was the Bonnie! I am stll deciding. So many wonderful items to choose from. I had it all picked and then my husband got in on the act. He’s a great cook and he’s wanting a new saute pan. Me…I was aiming for a knife that Cathy recommended and a panini grill. I’ll have to add a bit…but still…what a wonderful gift! I’ll let you know what the final decision is! Your pictures and recipes always make me hungry! 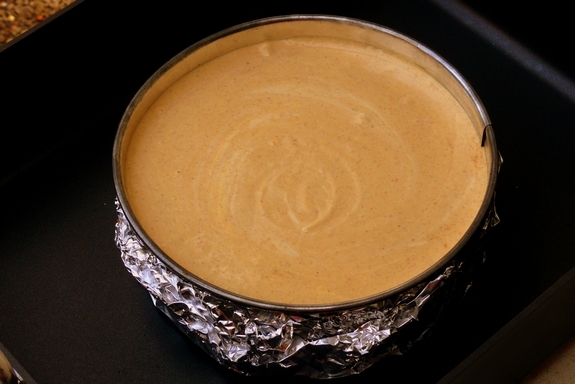 LOL – Pumpkin Cheesecake is in the oven cooling as I type – can hardly wait to taste it – not sure we can wait until tomorrow! Will have to try it again as mine cracked – guess I’ll have to cover the cracks with whipped cream! mmmmmm……. Wow this looks like the best pumpkin cheesecake! This is the best ever pumpkin cheesecake! The hardest part is to wait overnight for it to set! I waited and was oh so glad!!! My top cracked while in the oven baking – I did not have it on the middle rack – I think it was too close to the top of the oven – next time (oh and there will be oodles of next times!) I’ll try a lower position in my oven. All I can say is DELISH!!!! Thanks for sharing your love for food with us! Ok, that sounds amazing. I’m assuming you just drizzle over the top before serving? Can you provide a link to the apprpriate recipe, as I found a few online.